Get great deals on Vodice hotels! 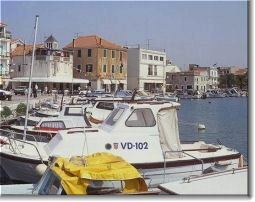 Only 12km northwest of Sibenik, Vodice is a former fishing village turned pleasure port and tourist centre. The historical centre of Vodice is small and picturesque but the main activity takes place on the harbour, which is crammed with restaurants, restaurants and more restaurants plus a few boutiques and souvenir shops. Churches and walls are the main sights to see in Vodice. One three-storey tower of the original 16th-century walls remains intact. Admire the richly ornamented baroque facade of the parish church built in 1749 and the baroque belfry erected in the 18th century. Inside, the painting of the Holy Family on the main altar is notable. West of the town centre is the small church of the Holy Cross built in 1662. Summer nights are throbbing when the Baloo Beach Club gets going. During the day, people drift in for finger food and juice, hanging out on the deck and taking dips in the sea. From 4pm a DJ starts spinning for Happy Hour. Then there's the After Beach party and then more. If you don't find what you're looking for, don't forget that Sibenik is right nearby and there's a wide selection of accommodation in Sibenik. There are a wealth of buses from Sibenik to Vodice but much more pleasant are the daily ferries. There are three ferries a day from Sibenik to Vodice, stopping at Prvic and Zlarin. The Vodice tourist office (022-443 888) is at Ive Cace 1a.